After the fun of Carcassonne came the fun of Pau. A nice enough place to visit in its own right (and family home to our travel companion Claire), the southwestern city of Pau also hosted the Tour de France while we were in town. I’m not much of a fan of the sport as a spectator, but our group had a few cycling nuts among us, so it was a must-see to throw into our planning stage. As the competition snakes its way around the beautiful French countryside, various towns along the way are closed down to traffic and set up for the race. On the day itself there’s a huge amount of hype, with the sponsors’ caravan preceding the race, when a convoy of vehicles bedecked in sponsors’ logos and other amusing rig-outs drive along the route chucking freebies at spectators. I was delighted, having left Scotland for sunny France without a hat, to pick up a cap from the Credit Lyonnaise vehicles, even if it did mean I looked like I was now endorsing the global banking and finance industry. 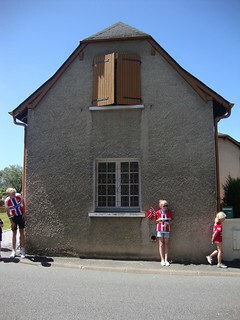 Then it was on to the race itself, for which we headed along a few streets to an uphill stretch. These are, of course, always the best places to see cyclists because they go a little slower. Imagine the normal speed of the Tour de France cyclists, and then imagine their ridiculous downhill speeds – you wouldn’t want to be standing on a corner there! 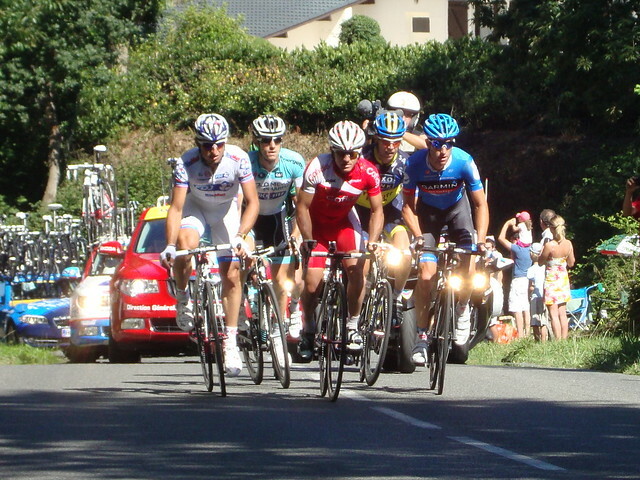 The cyclists were fanfared by various team support cars and camera motorcycles, plus the thud of television helicopters above. Soon, they came by – the leaders’ pack first, and then a few minutes later the rest of the cyclists. In a matter of moments, it was over. Not for the competitors, of course – they would have many more days of cycling, through the intense heat of the French summer and often on gruelling alpine inclines. But for us, it was all done and dusted in a multicoloured burst of lycra zipping past us at breakneck speed. I heard that the Tour de France is the most spectated sporting event in the world, if you add up everyone who watches it at all the different places along the way. It was nice to be able to say that I’ve been one of them, though I doubt I’d do it again. Even with the promise of another free baseball cap.